Less and less people are now watching the good old traditional TV and many are looking towards the internet to satisfy their multimedia needs. And while there are a lot of services out there that offer the viewer a collection of free tv shows to watch for free, it comes with a cost and it’s not always nice. There are thousand of websites that claim to have huge databases for streaming and watching TV shows but in reality, these are just gateways to other websites that ask you for a fee, surveys or to click on different ads. And while this is a nasty practice in itself, more and more services make you download files that more often than not contain malicious software like trojans, viruses or ransomware programs. If you got infected recently or if you’re suspicious, here’s how you can remove ransomware from your PC. That being said, while the internet is not the friendlies of places when it comes to free stuff, it’s important to know how to look for services that allow you to watch TV shows for free, without a big headache. Crackle lets you to watch full TV shows episodes and full movies for free, while also allowing you to create personalised watching lists. Crackle is available on all major platforms, including mobile with the Crackle app for iOS and Android. However, since Crackle is an entirely free service, it’s supported by ads, meaning that you’ll get the occasional ad while watching your favorite TV show. Crackle is an excellent service, all you have to do is create an account, log in on your favorite device and start watching. Share TV is one of our favorite services, with probably the largest database of TV shows and movies that we could find. Share TV claims to be a community driven site for fans of network television and for the looks of it, they are probably right. 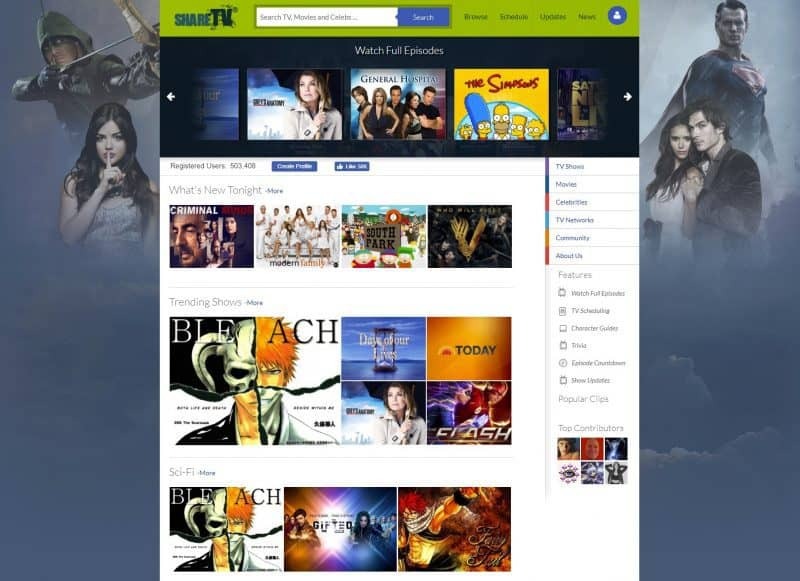 You can browse the large collection using the right side panel where everything is nicely categorized by genre along with TV scheduling (so you won’t miss upcoming TV shows), trivia and community discussions. It’s important to understand that Share TV is practically a movies hub, if you will, clicking on a TV show episode or movie will allow you to choose multiple sources with options to watch for free, subscription-based, purchase or TV anywhere. If you’re familiar with torrents, you’ll know they are not the most well-regarded bunch. While many torrent sites offer legit media (after all, torrenting it’s just a distribution method), they are known for their pirated nature. 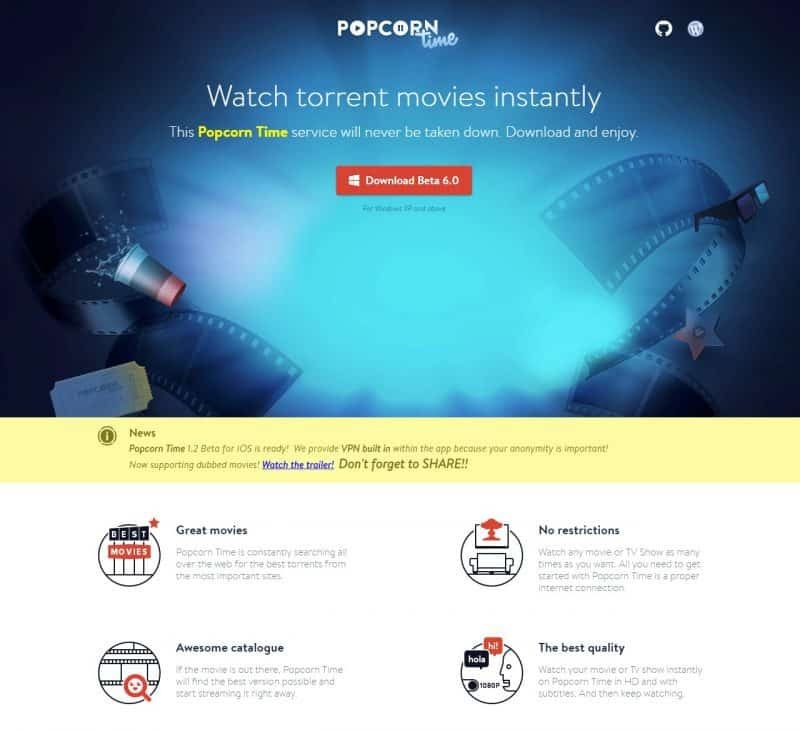 Popcorn Time is an open-source application that allows you to stream TV shows and movies for free using external torrents. The app is very easy to use and while watching torrents usually is not the simplest of things, Popcorn Time makes this a breeze. Popcorn Time offers high quality streams with a layout similar to Netflix. 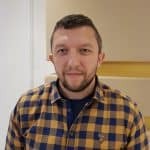 While the service is heavily used and it’s highly praised by its users, you have to understand that many movies watched on this platform are probably pirated. Before jumping on the platform, please keep this in mind since this is stolen media, you have to take a look at your country’s laws regarding torrenting. Tubi is another excellent service that allows you to watch free TV shows online. The service operates 100% legally, operating through license agreements. 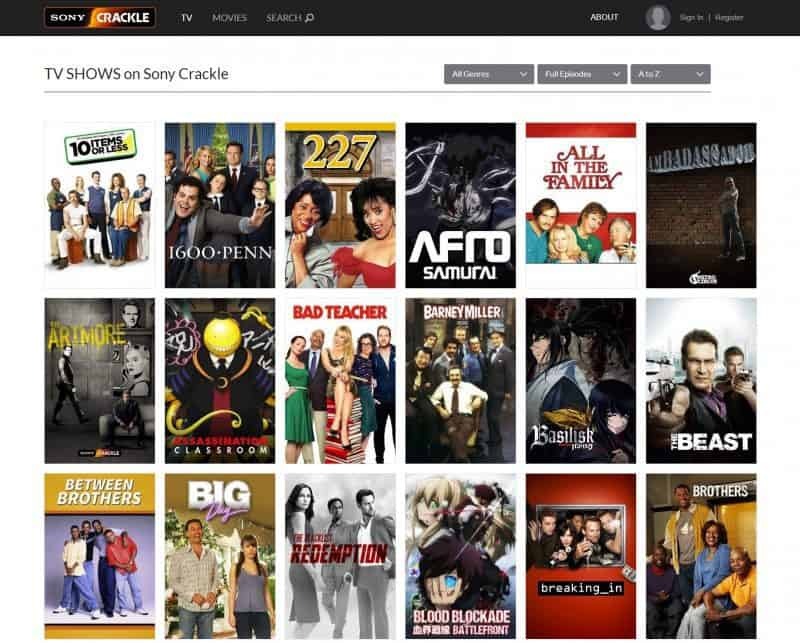 Similar to Crackle and other services, Tubi is offering TV shows and movies but it doesn’t require you to create an account, you can browse the site annonimously. It’s worth noting that by registering to the site and creating a free account allows the service to track your watched history and show you relevant TV shows or movies. If you live in the EU, keep in mind that you can’t visit Tubi due to the change in EU laws. However, you can go around this by using a good VPN. Yidio is a TV show aggregator simiar to Share TV that allows you watch TV shows for free from other 3rd party providers. Yidio has a very clean and simple interface that lets you sort movies by genre or TV channel. 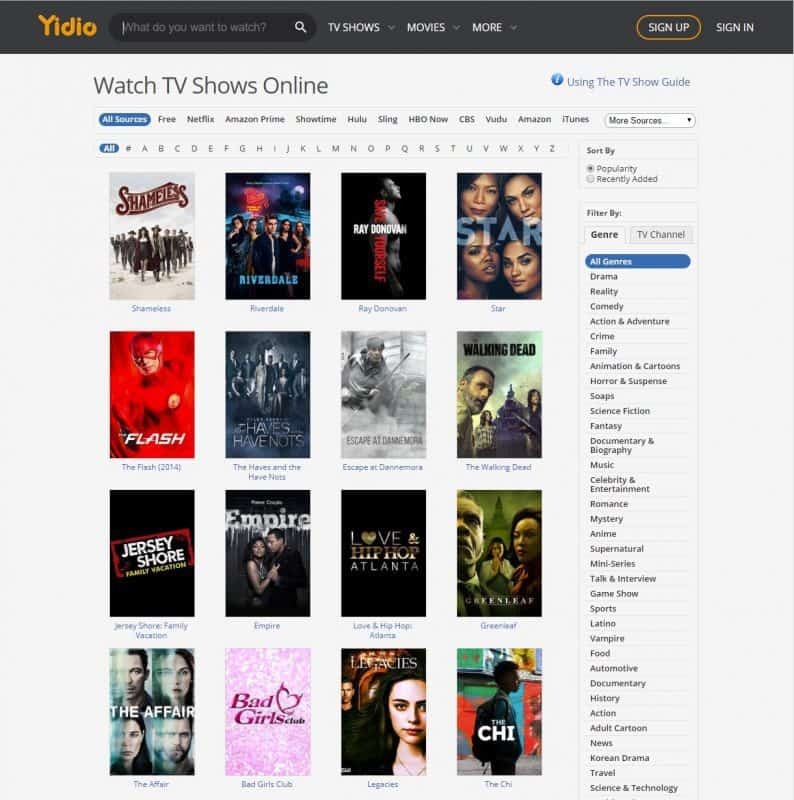 What’s nice about Yidio is that it offers you the possibility to watch free TV shows by source-filtering. 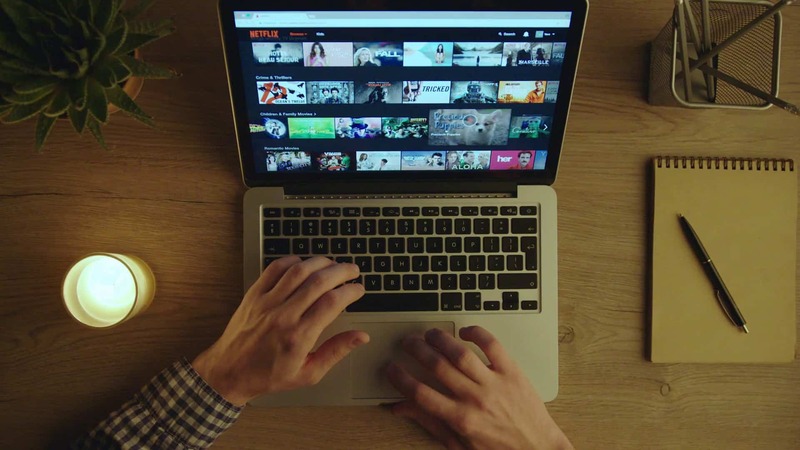 What this does is filtering your TV shows by its provider, free or permium, such as Netflix, iTunes, Amazon Prime, HBO Now and many others. You have to keep in mind that watching free TV shows on Yidio is ad-supported and not always very accurate. The site will often show you short clips instead of the full episode and it’s not very up-to-date. While this may be a downer for many, we recommend you take a look and test the service for yourself. TV Player is an UK based service that offers an impressive collection of TV stations including BBC 1, Discovery, BET, ITV, Dave, Five, History HD and many more. (95 total TV stations currently). 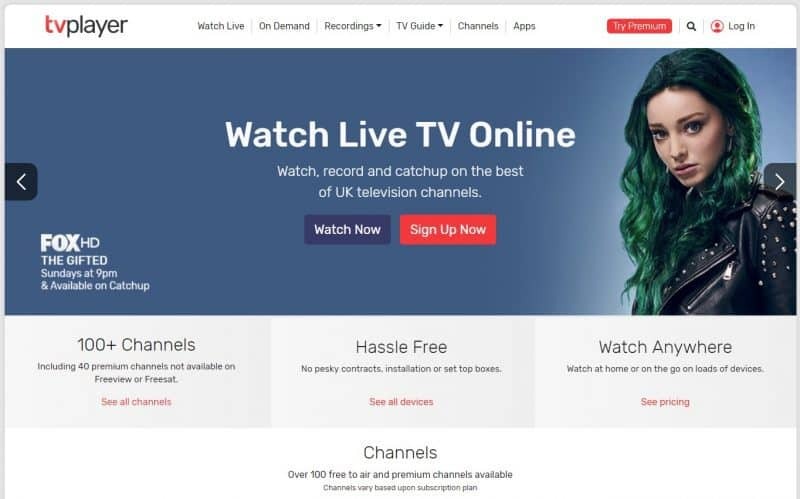 The service also provides not only recorded TV shows and actual live ones, as they are broadcasted, which makes TV Player a very good alternative. You have the option to record up-to 2 hours of TV shows, watch your favorite channel in 1080p or catch up, in case you mised the first minutes of the show. 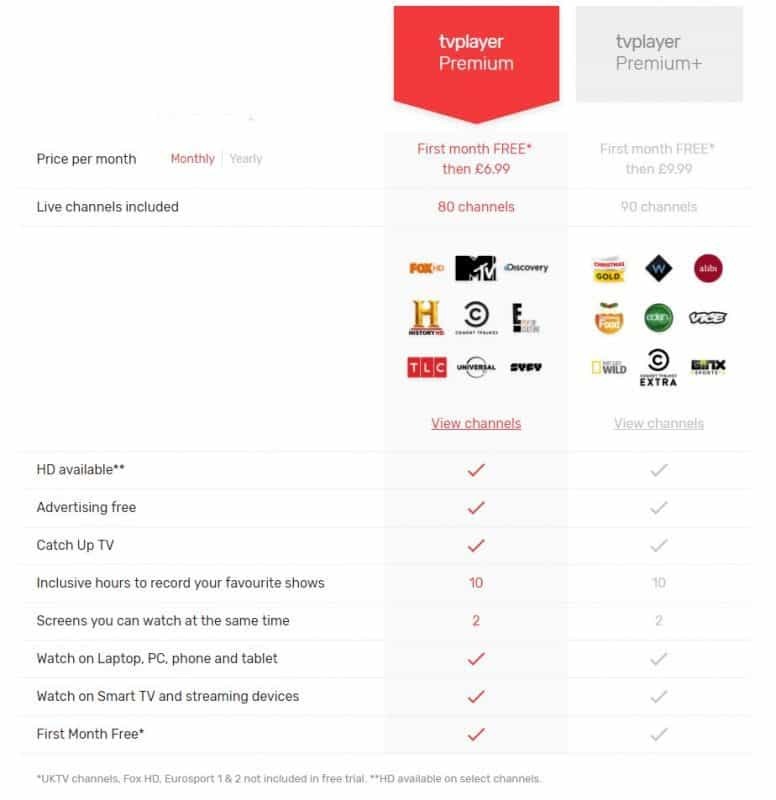 Keep in mind the free version is ad-supported, not all channels are available to free users and features like recording are only available to premium users. As you can see, subscribing to the service brings you a sleuth of features that we think is worth the £6.99/month fee. However, the service is available only for UK-based users, if you’re from the US you can circument this only by using a VPN. 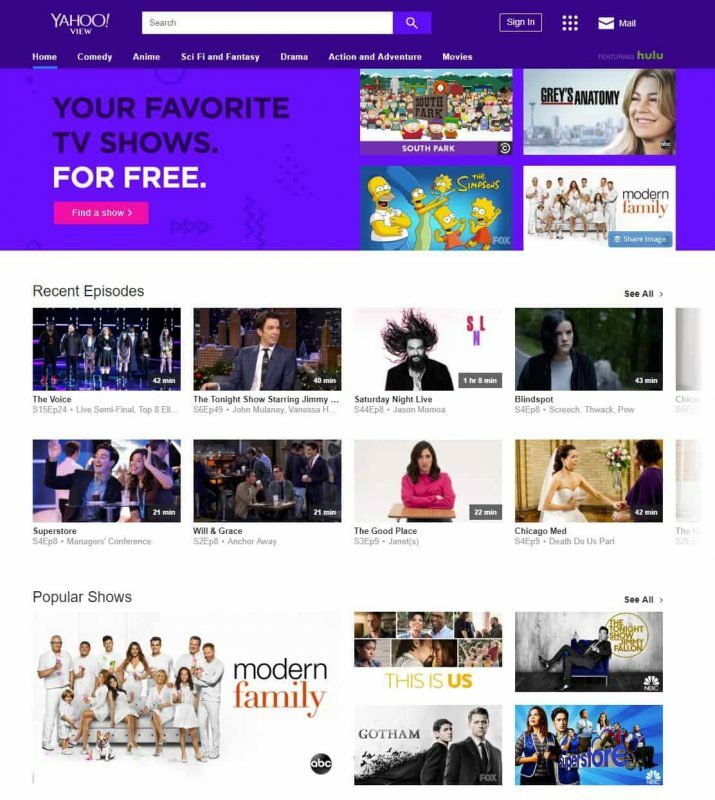 When Hulu stopped its free streaming service back in 2016, Yahoo partenered with them to launch Yahoo View, an impressive collection of free TV shows that was previously available to watch for free in Hulu. While you won’t get the newest of episodes, you can watch the latest five shows with the condition they aired for eight days. Yahoo View lets you stream TV shows from NBC, Fox, and ABC, including SNL, Tonight Show, The Voice, and many others. If you missed any shows that aired on TV, Yahoo View is a great resource for catching-up. Microsoft Office is one of the most popular office software suites and the 2019 edition adds improved security and several new features.